When you think of Twitter, it is not in the realm of users like Facebook but there are many people who like to jam in thoughts, view, opinions, sharable content and more in just 140 characters. With such a small number of characters it is easy to post 10+ tweets in a matter of minutes. With millions of users, billions of tweets have been made since 2006. So what happens when you need to go search for a particular tweet on twitter by someone you follow that you saw weeks ago, possible over six months ago? Previously on Twitter unless you made the tweet a favorite (used more so as an acknowledgment you enjoyed the tweet) trying to find the tweet was essentially a needle and haystack mission. 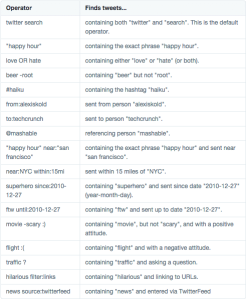 On November 18th 2014, the Twitter engineering team released an exciting tweet announcing they were close to enabling every tweet ever made publicly available. They were open about the process of getting to this point which took a number of years of work. The experience for tweeters, both regular and irregular will be enhanced going forward. If you want to look up any information you can expect Google to give back the decent results. Trying to search on a website for a particular blog or article? Many entrepreneurs lament the poor irrelevant results. Twitter is looking to step up to Google’s standards in search ability. The search function is available at the top of your Twitter feed, or at target=_blank”>Twitter search. While the basic search is capable, learning the tricks of how to use the advanced search feature will enhance your Twitter search experience remarkably. Some of the best features in the advanced search include the ability to search by language, date range and location. To enhance the experience as a user, you may want to become more familiar with search operators that can be found in the screenshot below. Similar operators are available on most advanced search functions however tend to get under utilised. With hundreds of billions of tweets archived, being able to filter down to a smaller number of results is so helpful. This development was made to benefit users primarily. 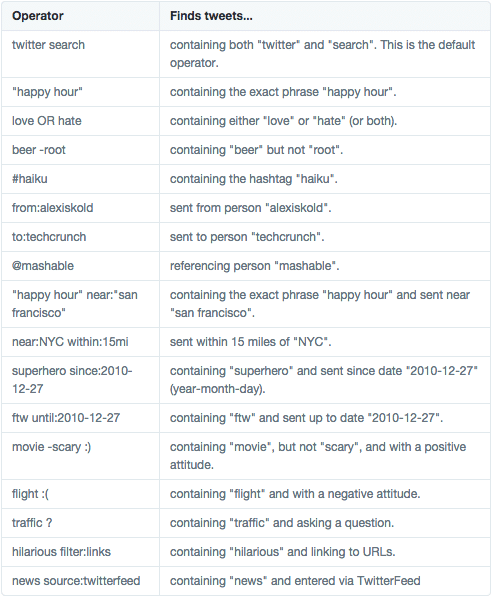 For marketers, using unique hash tags to create a campaign is likely the best way to curate user tweets however to fetch data for various factors, the search function will now be able to provide more accurate results. Twitter has been a great resource for the latest developments on worldwide events with hashtags quickly trending for those who want up to the second updates. Post these events, you will now be able to get a brief synopsis of these events thanks to the search function. With content able to be created and published in seconds on Twitter through to hours via documentary and everything in between there is naturally going to be a lot of repeated fluff. The search function on the largest content curating sites will become more valuable. It will be interesting to know down the road if Twitter can derive the value the company as a whole gets from the enhancement. Are you a Twitter addict or have not explored the platform yet? What does the new and improved search function mean for you?